Hello from the Lutheran Heritage Foundation! LHF, is a recognized service organization of the LCMS. 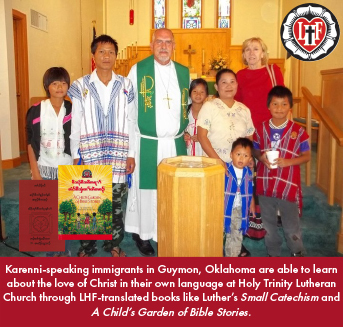 If you’re not familiar with LHF, our mission for the past 25 years has been to translate and publish the books of our Lutheran faith, like the Small Catechism and A Child’s Garden of Bible Stories into 100+ languages. LHF provides these resources – FREE OF CHARGE! – to churches and ministries going on short-term mission trips to other countries, or to share the Gospel with immigrants in your community who don’t speak or read English well. As an example, in the Oklahoma District, we’ve provided books to churches like Trinity Lutheran Church in Guymon. LHF’s challenge has always been getting word of these FREE resources out to the people. If you are interested in any of these resources, click on this link: www.lhfmissions.org. Our goal is simply to get more good Lutheran books into the hands of your pastors and missionaries!